Home Styles Biscayne 5-Piece Set includes 42-inch Round Outdoor Dining Table and Four Arm Chairs with Sunbrella<sup></sup> Green Apple fabric Cushions. Set is constructed of cast aluminum with a white finish. Features include powder coat finish sealed with a clear coat to protect finish, attractively patterned table top has center opening to accommodate umbrellas, and nylon glides on all legs. Add spice to your home dicor with the Home Styles Moroccan inspired 5PC Dining Set. This set is intricately handcrafted and sure to add the perfect touch to compliment any design. Constructed of acacia wood solids and hand laid slate tiles providing a mosaic appearance. This stunning table features a wire brush finish on the legs while the chairs feature a slat back and a shaped seat. This dining table and chairs are suited for both indoor and outdoor use. Finish and measurements may vary. Set includes table and four chairs. Assembly required. Table Size: 36w 36d 30h. Chair Size: 17.75w 21.25d 35.75h. Biscayne 5-Piece Patio Dining Set with 42-inch Table and Four Cushioned Arm Chairs Home Styles Biscayne 5-Piece Set includes 42-inch Round Outdoor Dining Table and Four Arm Chairs with Sunbrella<sup></sup> Green Apple fabric Cushions. 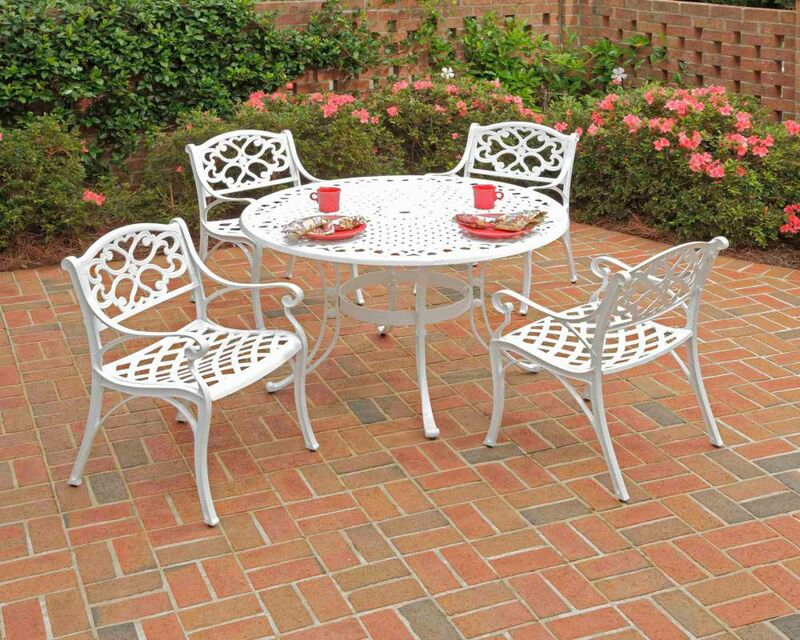 Set is constructed of cast aluminum with a white finish. Features include powder coat finish sealed with a clear coat to protect finish, attractively patterned table top has center opening to accommodate umbrellas, and nylon glides on all legs.